basis. I'm not trawling the net for these pics. Honest. In the last piece I mentioned the New Scottish Chess. recent Olympiad? The Scottish Notice Board boiled over. piece about the controversy covering the team selection for the 1968 Olympiad. debate and resulted in several members of the executive resigning. And that is all I'm going to say about it. and you will get 6 magazines free (plus all kinds of other things). the Scottish Players games from the 1968 Olympiad. only SCA members will be able to download games - another reason to join). Well I found a whole clutch of brilliant blunders. What is the collective term for a group of blunders? Oh yes. We can only win if out opponent blunders. part of the art of chess playing. White forgot a Reinfeld rule. Check all checks. complicated game with chances for both sides. 33 Rg1 Ba4+ 34 Kb1 Qxf8 0-1. I lost my Queen in the same manor to Neil Berry in 1997. My first loss as a Bells player thus ending a run of 25 games. W.24 D.1. Now this is a very instructive blunder. Look and learn. the simple 10 gxf3, starts to think of pawn structures. on b5 hangs. I'll swap off my Bishop with a check and then play Qxf3." Black time to play 11...Be4 and remain a piece up. it remained that way when White resigned a few moves later. The moral: Don't think about forced re-captures. Just do it. 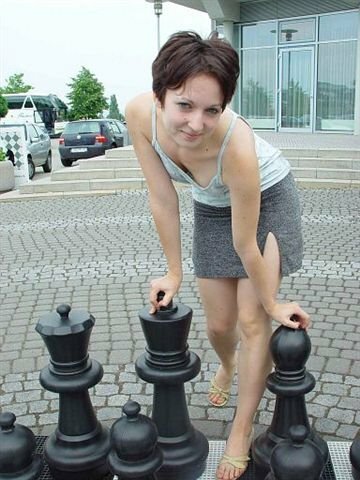 Who says there is no luck in Chess? This one is just plain unlucky. down but there is still some chess left in this position. Who amongst us would not play 33 Bd5 here? prevent the Rook from getting behind Black's passed a-pawn. is pinned and Black has a stinker of check on d6. 33 Bd5? Qd6+ and White resigned ( 34 Kg1 Qxd5). And in good Chandler tradition the best (worst) is saved till last. White to play. 31 Ne6 is the best looking move. However White has an idea and played 31 Rdxe7? has winning moves like Qa1+ and Qd7 up his sleeve. Unfortunately this is all pie in sky. 31 Rdxe7 Bxe7 23 Rxe7 Rxf4 and White can resign. But amazingly Black did NOT take the Rook. He believed White. He thought the sac was sound. 31 Rdxe7? Qxa2? 32 Rxh7+? Kxh7 33 Qd3+ and Black resigned?? and gxf4 stops that plan. OK then what about 35 Ne6 or 35 Nh5. Well 35...Qxf2+ and mate appears to halt that little idea. In Black's defence we can assume he was in time trouble. The funnies happened around about moves 30 - 36. This is where the usual 'time bombs' are. "Time trouble is not an excuse for losing" - Alekhine. I'm afraid Mike Freeman committed the biggest blunder of all. Resigning in a won position. positions (one in a correspondence game!). after the game was played when I was entering it into a database. Here is the S.Kagan - M. Freeman game. It got very complicated. Watch the Knights do a tango of death in the centre of the board. And finally a game from the recent Hawick tournament. Nigel Chapman (1659) - James Turner (1451), Hawick, 2006. Here is position after two moves each. There is no rule that states White must play 1.e4 or 1.d4. not try to hang onto a gambit pawn offered by White. make a decision that governs the course of the game. Here he could have (should have) played 10...e5. This vacates e5 for the d7 Knight and Black is doing OK.
What happens is Black sits back and waits for more White 'daft' moves. The juicy 10...e5 is ignored and instead Black found 10...Rc8? behind the move that is wrong. White sent the g and h pawns off on a bayonet charge. will White miss the final combination when it presents itself. Black plays his part with some typical under 1900 defending. White checks and uncovers an attack on the hapless Queen and it's all over. (same theme as A.Malagon - D.Levy). going the expense of shelling out £14.95 for an opening book. the whole episode as an unlucky freak game. After all, "How can anyone lose against 1.h3 2.a3?" Mike Basman named this 1.h3 2.a3 'attack' the Global Opening. name Global Opening is rather poor. It's not catchy enough. I advocate we call it The Toad. playing 5 minute chess and at the same time taking part in a Pub Quiz. side of Edinburgh and Kafka was taking part via his mobile phone. Asked Kafka suddenly to a bunch bemused chess players. opening named after a British amphibian. So The Toad it is. Here is a picture of a Toad. 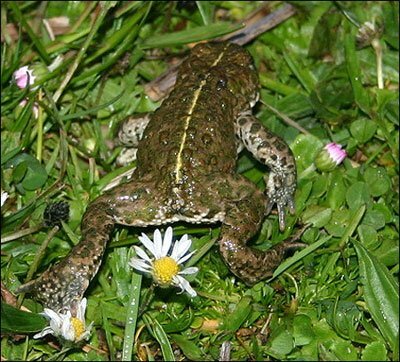 The Natterjack Toad. Nobody has ever seen the face of a Natterjack Toad. A Toad is the ideal creature to represent this opening. It crawls along sneaking up on it's unsuspecting prey. The Toad, unlike it's cousin, the Frog, does not jump. The Toad crawls. called Ilya Frog and people would associate his name with the opening. he ate worms. At school his nickname was Tad. There is no chess player called Toad. We have a Todor, but no Toad. Which is rather a pity. Imagine the note when the guy is in trouble. So what are the four British amphibians? I suggested "toad, frog, newt and er.....tadpole!" Kafka shrugged his shoulders and sent it as the answer.